Boko Haram has released the video of five “commanders” that were swapped by Nigerian authorities on 6 May in exchange for 82 Chibok schools girls. All the five insurgents shown in the 6 minutes 30 seconds video dressed in full military fatigues, alighted from a Hilux vehicle mounted with a machine gun. Daily Trust reports that one of the men claimed he was Abu Dardaa, saying he was arrested by Nigerian security forces in Gombe State, taken into custody alongside many of his “brethren” but set free for the exchange of the Chibok girls. “I’m Dardaa, popularly known as ‘moni,’ who was arrested by the infidels after detonating explosives. I’m now fully back in Sambisa living with my brethren. It’s the same place you claimed you’ve taken over,” the man who spoke on behalf of the remaining four, said. Spokesman of the Nigerian Army, Brigadier General Sani Usman Kukasheka has dismissed the video as a mere propaganda. However, he confirmed that one of the men featured in it was part of the exchange programme with the Chibok girls. A statement issued on Saturday by the Army, said the threats issued by the terrorist should not be taken seriously as it is merely an attempt to seek relevance and attention as he has lost touch with realities on ground after years of incarceration. “As you are all aware, he was a direct beneficiary of the process that led to the release of 82 of the abducted girls, and does not have a say or capacity to do anything, therefore his threats should be ignored,” Usman said. He said the army will not relent on clearing remnants of Boko Haram terrorists through the ongoing operations with the support of the Nigerian Air Force which has been carrying out air raids, while other security agencies are equally doing their best. cooperation and understanding from the public, particularly members of the press,” he said. “We should not give in to terrorists’ propaganda and empty threats. glamorize terrorists and their criminal acts,” the Army statement said. 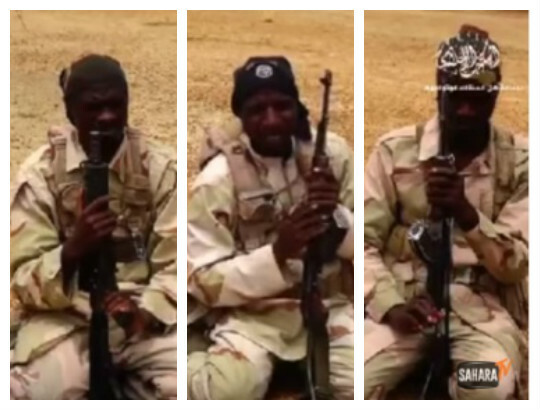 0 Response to "JUST IN: Freed Boko Haram members brag in video claims Nigaria Force are lieing about their take over of Sambisa"